The Talking Box: White Collar: Done with "Rebecca"
White Collar: Done with "Rebecca"
Why anyone would want to live in Washington, DC over Manhattan is beyond me! Still, I wish Peter and Elizabeth the best, even if that means there will be different scenarios in the future of this series. But, speaking of futures, it seems like Neal doesn't have one right now, having been absolutely heartbroken by "Rebecca," whom I now loathe. Thank goodness for Mozzie, and thank goodness for their continued side projects, which will undoubtedly help pass the time now that it looks like Neal will have a lot more of it! Of course, maybe he'll end up going to Washington, too, though by the looks of it, he's going to attempt to "get out for good behavior" and stop having to work for the FBI for pennies. Regardless, something exciting (and unrealistic, of course) is bound to happen again soon! Neal talks to Curtis and offers him the window for the video of the heist, but Curtis has already kidnapped Rebecca to make sure he retains the upper hand. [I'm also taken by surprise when villains think ahead!] Neal only has 30 minutes to deliver the window with Mozzie, and when they can't figure out where Rebecca is being kept in that short amount of time, they decide to bug Curtis to determine that location. But, Curtis forces Mozzie to solve the mystery as Neal goes to work on an art forgery case, so Neal winds up bugging the art dealer instead. The forgery in question was done by Curtis, and with the FBI tracking him, Neal wants the latest. [I thought everything in this part of the story moved really quickly!] 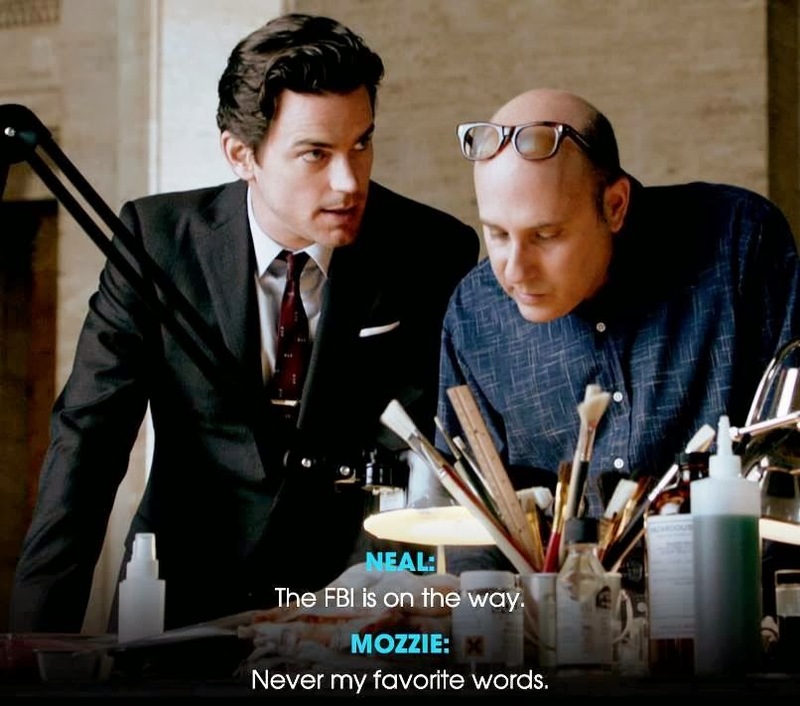 Meanwhile, Mozzie is forced to trace the images directly onto the codex, then memorize them, as Neal threatens to burn the pages if Rebecca isn't released. White Collar "Shot Through the Heart" (S05E11): Peter and Neal leave Rebecca's apartment and start to figure out how she killed David. Neal tells Peter everything about the codex and the Hope Diamond's twin. [but somehow Peter isn't super-interested in the details... strange.] Neal has to keep up appearances with Rebecca, and while he's with her, the FBI raid her apartment. A file gets dropped and sets off the alarm, forcing Neal to stall her a few more minutes before she runs off to a "doctor's appointment." [smart of Peter to set it up to look like the place was just flyered!] Four security cameras placed in her residence reveal that she's packing up everything from her other aliases.